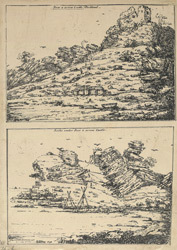 Two views of the ruins of Bow and Arrow Castle in Portland probably etched, but there is a possibility they may be dry point. This castle is sometimes called Rufus Castle. However the present castle was was built much later than its names suggest. It was probably built by Richard, Duke of York between 1432-1460 as a blockhouse. It had a three storey pentagon shaped keep built of Portland stone. It was not designed for bows and arrows, but has gunports. The castle by the 18th century was a ruin as much stone had been removed for building material.